Single Segment strap (S1) – Strap made with securing/adjusting hardware on one end and specified length of webbing on the other. (see diagram above; also straps S2, S3, and S4 for additional options). Straps are made per customer’s specs, so submit a quote and a Cargo Systems Representative will assist you! 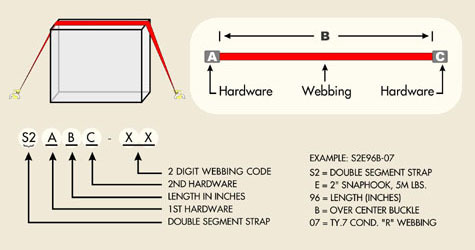 Single Segment strap (S2) – Strap made with securing and adjusting hardware on the ends, and specified length of webbing between. (see diagram above; also straps S1, S3, and S4 for additional options). Straps are made per customers specs, so submit a quote and a Cargo Systems Representative will assist you! 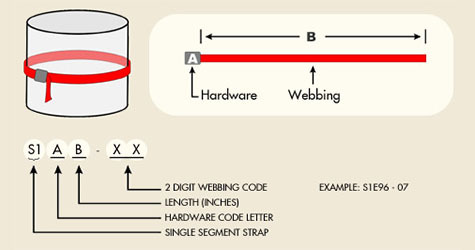 Single Segment strap (S3) – Strap made with adjusting hardware in the middle of the webbing, and specified length of webbing on both sides. (see diagram above; also straps S1, S2, and S4 for additional options). Straps are made per customer specs, so submit a quote and a Cargo Systems Representative will assist you! 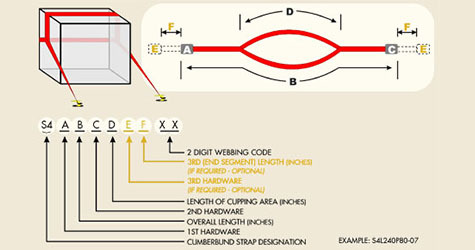 Single Segment strap (S4) – Strap made with either securing/adjusting hardware on both ends, and specified length of webbing between with a “cupping loop” to secure cargo. 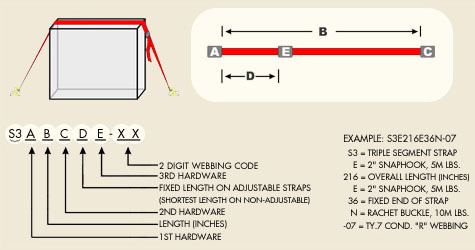 (see diagram above; also straps S1, S2, and S3 for additional options). Straps are made per customer specs, so submit a quote and a Cargo Systems Representative will assist you! -07 1.75″ Nylon 6,000 lb. -09 3″ Nylon 9,000 lb. -17 1″ Nylon 2,500 lb. -22 1.75″ Nylon 9,500 lb. -32 2″ Polyester 12,000 lb. -33 3″ Polyester 18,000 lb.